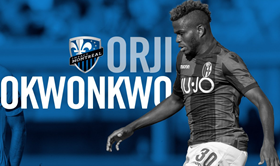 Major League Soccer club Montreal Impact confirmed via their official website on Tuesday that they have completed the loan signing of promising Bologna striker Orji Okonkwo. The 21-year-old will remain at Montreal Impact until the end of the 2019 season, subject to receiving his international transfer certificate, his visa, and passing his medical. Okonkwo has scored 3 goals in 30 appearances in all competitions for Bologna since his debut and spent the second half of last season on loan at Brescia. Commenting on the deal, Impact head coach Rémi Garde said : ''I’m satisfied in welcoming another striker to the team. ''Orji Okwonkwo is a young player scouted by Bologna three years ago who will help reinforce the team offensively. Okonkwo helped the Golden Eaglets to win the 2015 FIFA U17 World Cup in Chile, playing five matches and scoring once in the semifinal vs Mexico.